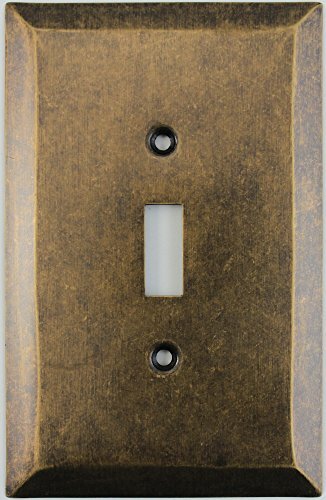 This beautiful wall plate is made of solid stamped brass that is hand finished to make it look like the brass plate has aged naturally. This plate would be a beautiful accent to any room in your house or office. Due to the finishing process, the finish on the plates will be slightly different from plate to plate. This one gang switch plate will accommodate one toggle light switch. Plate measures 5 1/2" by 3 1/2"
plate measures 5 1/2" by 3 1/2"
If you have any questions about this product by Classic Accents, contact us by completing and submitting the form below. If you are looking for a specif part number, please include it with your message. B&P Lamp Heavy, Antique Style Brass Canopy Kit, 5 1/2" Dia, Polished & Lacq.